Representatives of F2 Companies presented a revised development proposal for 2015 W. Fifth Ave. to Village Council at its March 11, 2019 meeting. 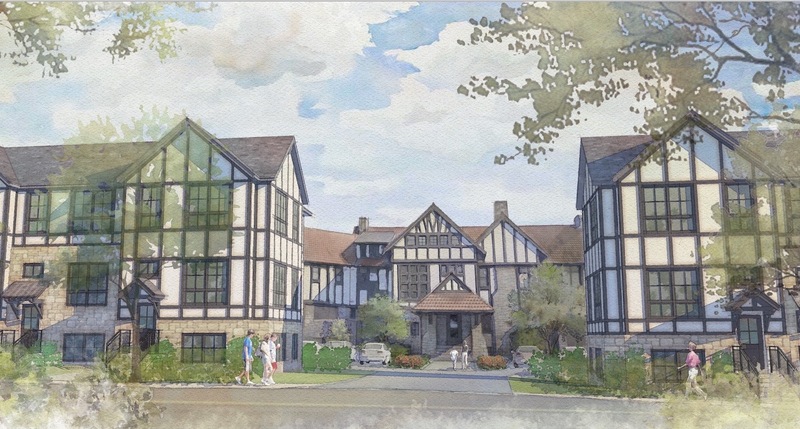 The proposed development, being referred to as The Packard at Marble Cliff, would highlight the existing manor house as the central focus of the new residential community. The project would contain no more than 37 units, consisting of a mix of one-bedroom and two-bedroom units. Additionally, three carriage houses would be built to provide 3 residential units as well as accommodate garage parking. Renovation of the manor house would also contain up to 4 residential units. The first floor of the manor house would provide The Packard residents with common space and amenities. For more information, click on 2015 W Fifth Development Package March 2019. Council will review the proposal as the first official step for consideration of rezoning the property as a Planned Development District (PDD). A PDD would establish zoning regulations specifically for this property. The rezoning process will include a public hearing at a future meeting of Council where residents will have the opportunity to share their views of the proposal. Notice of this public hearing will be provided to residents. At its August 20, 2018 meeting, Village Council accepted the official Concept Plan for residential development of 2015 W. Fifth Ave. The Plan presented by F2 Companies calls for saving and utilizing the existing manor house and developing the property with townhouses and flats, the total number not to exceed 40 units. Council will continue to review the Plan under the Village’s Code of Ordinances (Sections 154.094 – 154.099) for the creation of a Planned Development District (PDD). This review process by Council will examine the proposal in more detail. Public input is welcome during the process, with a scheduled public hearing as part of Council’s review. Link to a rendering of the proposal and site plan. A complete copy of the packet submitted to Council for consideration of redevelopment under a PDD is available at Village hall. You can be provided an electronic copy of the proposal by submitting a request to marblecl@rrcol.com. At its July 16, 2018 Council meeting, a new concept plan for development of 2015 W. Fifth Ave. was presented by F2 Companies to Village Council. The new plan calls for saving and utilizing the existing manor house and developing the property with townhouses and flats, the total number not to exceed 40 units. The plan will continue to be reviewed by Council, with its next regular meeting being on August 20, 2018. Public input is welcome during the review process. Link to a rendering of the proposal and site plan. The Columbus Landmarks Foundation responded favorably to the new proposal, as noted in a release (below) they offered publicly following the Council meeting and information posted on their website. “At this evening’s Marble Cliff Village Council meeting, the developer that proposed demolition of the 1907 Gateway Mansion to build a new apartment building presented an alternative concept that now includes reuse of this architecturally and historically significant building. Designed by renowned Ohio architect Frank Packard, the Tudor-style mansion has graced 2015 West Fifth Avenue for more than a century. The building is currently featured on Columbus Landmarks’ 2018 Most Endangered List. Columbus Landmarks applauds the building owner, the developer (F2 Companies), and the architecture firm (Sullivan Bruck Architects) on this new approach. 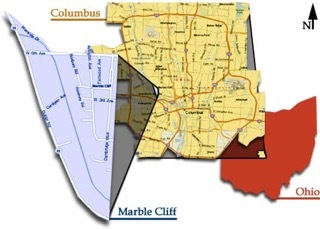 By incorporating the mansion in the redevelopment of the site, the important character and identity of Marble Cliff Village will be retained while serving as a catalyst for future prosperity and economic growth. 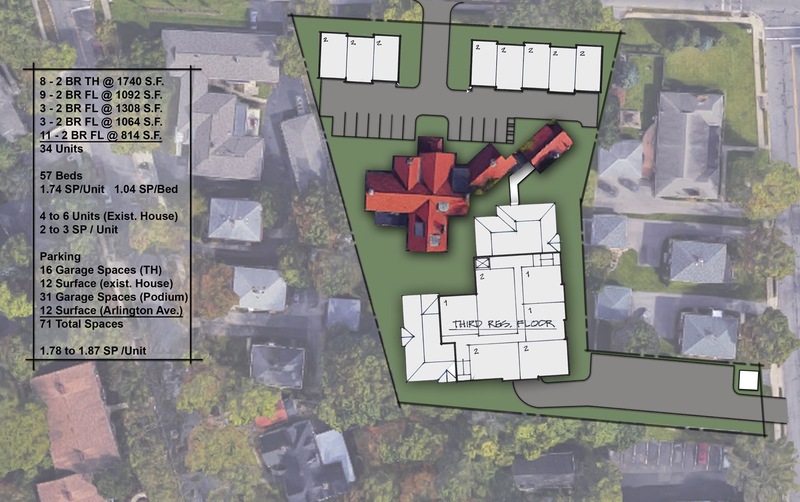 The new proposal calls for eight carriage houses at the front of the site bordering West Fifth Avenue including a gateway entrance drive that retains a view of the mansion from the street; removal of a non-contributing addition at the rear of the building; removal of an apartment on Roxbury Road to create a second, traffic-calming entrance/exit to the development; and construction of a new-build, three-story structure behind the mansion with 34 units and a connector walkway to the original mansion. A portion of the existing mansion may be used as a yet to be determined amenity area for residents, with the remainder to be potentially used for 4-6 additional residential units or a commercial tenant. Marble Cliff Village is distinguished by the gracious residences designed by Frank Packard, arguably the most historically significant Ohio architect. Packard’s portfolio includes Hayes and Orton Halls at The Ohio State University; the Atlas Building; the former Governor’s Mansion (now The Columbus Foundation); the Seneca; North High School; Memorial Hall; the T&O Railroad Building; the Sells Mansion; and other prominent courthouses, schools, and university buildings throughout the state.